Grand-Slam™ Series HSI, Horizontal Shaft Impactor, from Stedman Machine Company uses high-chrome metallurgy to significantly increase the wear life of machine components, reducing metal replacement costs. The size reduction crusher tackles a variety of applications from aluminum dross and clay to floor tile and scrap carbide recycling, reducing material size more efficiently with maximum up time. The Grand-Slam™ Impactor’s single drive design uses less horsepower per ton when compared to dual-drive systems, lowering operating costs. The Grand-Slam™ Series consists of 10 high-production models with test capacities ranging from 5 to 700 TPH. The impactor design incorporates both primary and secondary aprons for maximum product control, eliminating the need for high-maintenance grate bars and discharge screens that often clog. 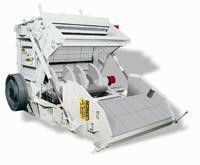 The impactors' two-stage crushing action is designed to produce more product on the first pass with reduction ratios up to 30:1, even while handling large and slabby feed material. A full-length rotor shaft with 2, double-row spherical-type bearing assemblies features a taper lock design to strengthen the rotor for highest reliability. The rotor features either a 2-row, 3-row or 4-row breaker bar design, depending on machine model size. A wedge locking design secures the breaker bars in place and simplifies breaker bar servicing. The high chrome breaker bars can be rotated multiple times before replacement, optimizing metal utilization and wear life. The rotor lock table, a Stedman-exclusive, facilitates breaker bar rotation and replacement, saving time and further optimizing wear life. For unimpeded access to the crushing chamber, either front or rear opening housings are available to meet customer system designs. In conjunction with the rotor, the Grand-Slam™ Series primary and secondary aprons make up the impactors' two-stage crushing action for increased throughput. Both the primary apron, where initial size reduction occurs, and secondary apron, where final reduction takes place, is lined with interchangeable 3" thick tapered, high-chrome liners for maximum wear life. Both aprons are manually adjustable from the external housing for precise gap adjustments. For additional product control, an optional secondary apron spring bridge assembly provides additional force to maintain gap settings yet allows for retraction of the apron under extreme loads and immediately returns to original setting. Side liners of the Grand-Slam™ Series come in only 3 different shapes - triangular, rectangular and square - and are interchangeable from model to model to reduce maintenance and inventory costs. The 2" thick, high-chrome liners are designed to withstand the abuse of impacting even the toughest materials for long wear life. A variety of optional equipment is available for Grand-Slam™ impactors, so customers can outfit their machine to meet specific application requirements. Apron heaters, installed on the feed chute and primary and secondary aprons, minimize buildup when reducing wet and sticky materials. To minimize cross-color contamination, customers can use the optional air cannon, which discharges a blast of air into the crushing chamber to quickly dislodge material buildup. Together with the cannon, elimination of ledges and minimal ribbing allow for faster crushing chamber clean out. The optional variable-speed drive allows for on-the-fly product gradation changes to enhance peak operating efficiency. As with all Stedman products, the customer is encouraged to test each application before purchasing a Grand-SlamTM. Stedman uses only full-size equipment to test a wide variety of materials to enable customers to select the best machine for the application. With a sample of feed material, Stedman engineers will conduct an application analysis and provide a confidential, written report of their findings to the customer. Stedman can also produce an analysis by using one of over 10,000 application reports on file. Stedman, the originator of the cage mill, is the leader in providing solutions for size reduction needs. Stedman's full range of equipment includes vertical and horizontal shaft impact crushers; cage mills, lump-breakers and fine grind mills.